The mafic-ultramafic Monchepluton is located in the Kola Peninsula, some 150 km to the south of Murmansk, and probably has the longest history of mining and exploration, starting in the 1930s when contact-style mineralization and massive cross-cutting Cu-Ni sulfide veins were discovered. During the 1990s and later on, detailed exploration of this area for Pt-Pd mineralization was undertaken. Pripachkin et al. 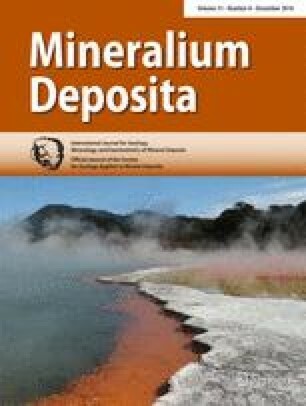 (this issue) document the geochemistry and Ni-Cu-PGE ore endowment of two of the sub-intrusions of the Monchepluton, namely South Sopchinsky and Gabbro-10. The authors use whole-rock major and trace element data to correlate the intrusive bodies with other blocks in the Monchepluton and the adjacent Monchetundra intrusions. Their results support work of previous researchers proposing that the area represents the contact zone between gabbronorite of the Monchetundra intrusion and norite and pyroxenite of the Monchepluton. The rocks were overprinted by post-magmatic veining and remobilization of contact-style sulfide and PGE mineralization. The Yoko-Dovyren layered intrusion is a 26 × 3 km body that is located in a remote terrain some 60 km to the NE of Lake Baikal. The first findings of Cu-Ni sulfide occurrences in this area can be dated to 1915; however, mining started only in the 1960s when massive Ni-Cu-(PGE) sulfides along the ultramafic base of the intrusion and in the immediate footwall were delineated. This operation ceased when important new Cu-Ni ores of higher grade were discovered in the Norilsk/Pechenga areas. In 1992, sulfide-poor PGE-rich mineralization associated with anorthosite schlieren located within the transition interval from troctolite to olivine gabbro was discovered. The study of Ariskin et al. (this issue) focuses on the structure, mineralogy, and geochemistry of poorly mineralized plagiodunite and dunite in the lower part of the intrusion. Assuming these rocks contain key information on the timing of sulfide immiscibility in the cumulate pile, the authors use their data to calculate the S saturation history of the basal portion of the intrusion, employing a combination of thermodynamic modeling using the COMAGMAT program and estimation of the average sulfide compositions of rock layers. Gongalsky et al. (this issue) provide an overview of the Chineysky gabbronorite-anorthosite layered intrusion, located in eastern Siberia, 500 km to the NE of Lake Baikal. The intrusion hosts Russia’s largest V resources within titanomagnetite layers, as well as contact-style PGE-Cu ores at Rudny and Kontactovy, with spectacular PGE-rich zones. The authors model the parent magma composition as being of evolved basaltic composition (having 5.8 wt% MgO) and suggest that sulfide ore formation was triggered by the onset of titanomagnetite crystallization. Two papers deal with isotope geochemistry of the 2.45–2.5 Ga layered intrusions on the Fennoscandian Shield (Karelia and Kola cratons). Bekker et al. (this issue) present the first multiple S isotope data as well as mineralogical constraints on the petrogenesis of Ni-Cu-PGE mineralization in the Monchegorsk Igneous Complex (MIC, comprising the Monchepluton and the Main Ridge massifs). They propose that assimilation of a large volume of silicate material from the host rocks triggered sulfide saturation in the MIC magmas. The crust contained a small amount of sulfur carrying the signature of mass-independent fractionation. Yang et al. (this issue) present Os, Nd, and Sr isotope data on the Kemi and Monchepluton intrusions. They use their data to evaluate the relative importance of sub-continental lithospheric mantle vs asthenospheric mantle in the source of the magmas. They conclude that the data is most consistent with asthenosphere melting, followed by crustal contamination. These results should have significant implications for other layered intrusions where the nature of the mantle source remains debated (e.g., the Bushveld Complex).